A young trumpeter swan, flanked by a pair of geese, struts at Six Mile Lake. 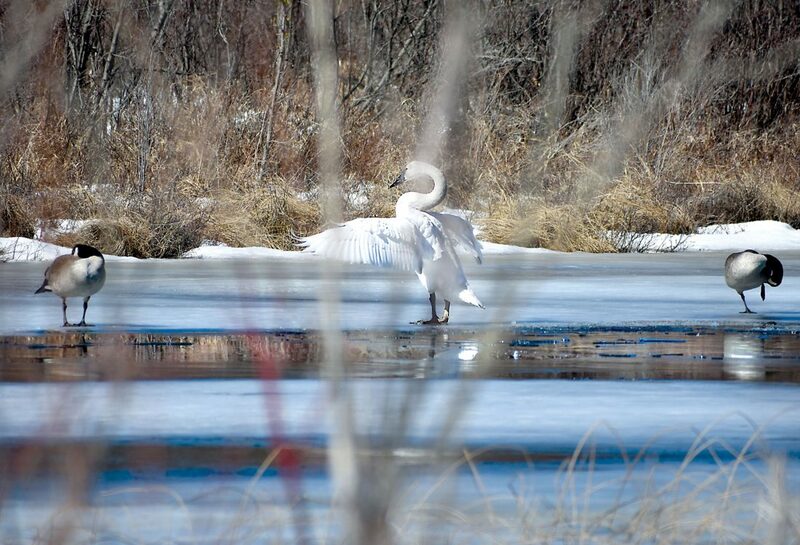 The Upper Peninsula has few birds more likely to draw a gasp than a trumpeter swan. I’ve heard them call in the early morning on Six Mile Lake in the past and photographed a solo and lost-looking juvenile two years ago, but this spring, a group of four showed up one day where the lake feeds into Six Mile Creek, and a younger individual — perhaps from that same group — lingered into mid-week. Seeing them up close and walking on the ice reinforces what impressive birds they are, dwarfing even bald eagles and the giant Canada geese in the region. Even the juvenile, which had silver-gray shading on its head and upper neck, made the geese look like ducks. The trumpeter swan is North America’s largest waterfowl at about 25 pounds and its heaviest flying bird. The avian equivalent of a cargo carrier, these birds need one of the widest wingspans at about 7 feet and a runway roughly the length of a football field to get that big body in the air, according to the Cornell Lab of Ornithology. They’re about twice the size of our other native swan, the much more numerous tundra, formerly known as the whistling swan, as well as the giant Canada goose, the world’s largest goose and the subspecies that nests in the region. And like the bald eagle and giant Canada goose, the trumpeter swan once looked destined to vanish. That breathtaking beauty and massive size was its curse. Commercially hunted for meat and plumage — feathers used for hats, writing quills, even the down-covered skins as powder puffs and clothing trim — trumpeter swans were extirpated from the Upper Midwest by the late 1800s. By the 1930s, only 69 trumpeter swans could be found in the entire lower 48 states, primarily confined to what became the Red Rock Lakes National Refuge in southwestern Montana, according to the Minnesota Department of Natural Resources. About 30 years later, it seemed the Midwest started missing its swans. In the 1960s, Minnesota began working to re-establish the species by bringing in adult birds from Montana, supplementing the program in the 1980s with eggs from Alaska. 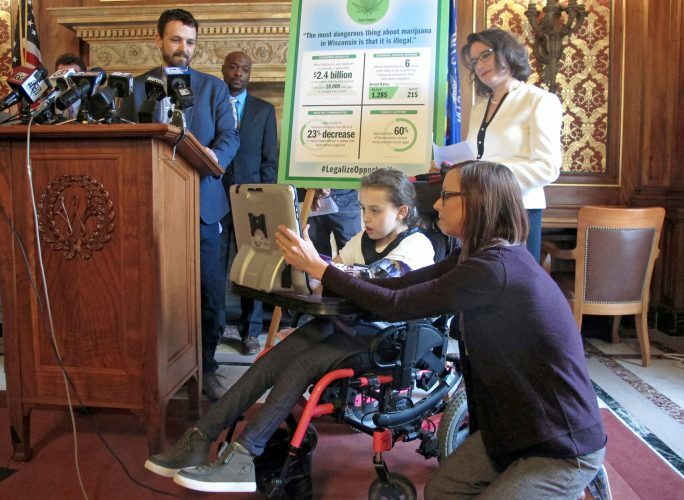 Wisconsin and Michigan joined in the reintroduction efforts in the 1980s as well, with Iowa and Ohio following in the 1990s. Though not without setbacks, the result has been that in 2015 the population of trumpeter swans had grown to more than 63,000, compared with 3,700 counted in the first range-wide survey in 1968, according to the Trumpeter Swan Society, www.trumpeterswansociety.org. They are the only native swan that breeds in the lower 48 states, including upper and lower Michigan, Wisconsin and Minnesota. 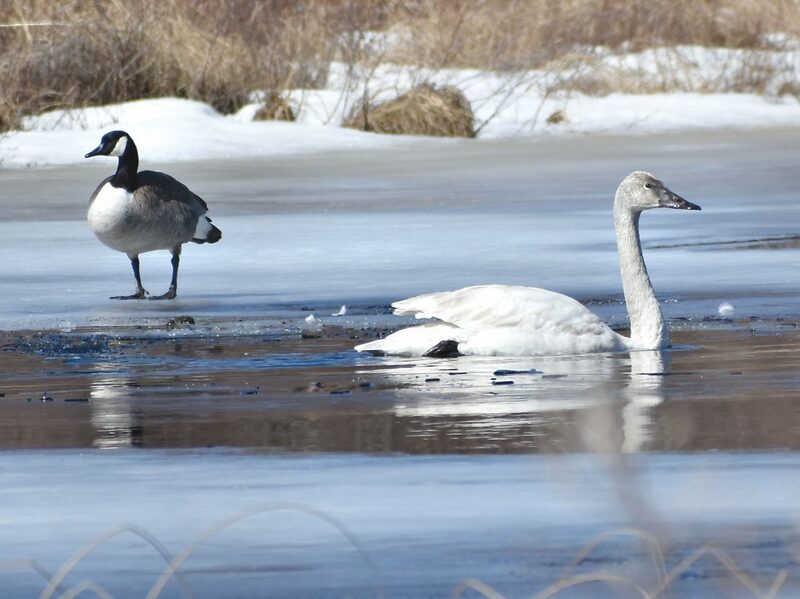 But tempering that success is the fact trumpeter swans remain missing from nearly two-thirds of their original range, the Trumpeter Swan Society added. Trumpeter swans tend to be short-distance migrants, if they migrate at all. Places with open water and vegetation — the swans tip like dabbling ducks to feed, using their long necks to reach submerged plants — may persuade them to stick around as long as possible in winter. Deep former quarry and mining ponds that don’t freeze over can be favorite sites, according to Cornell. While tundra swans also can turn up in the region, it’s usually only in spring and fall migration, as they nest in the arctic, as the name implies, and favor coastal waters in winter. Trumpeters tend to be in smaller family groups, too, the tundras in larger flocks. The tundras also have a yellow spot on the bill just in front of their eye, although that can be difficult to see in the field. Lower Wisconsin has feral mute swans as well, the classic bow-necked white birds from fairy tales that is native to Europe and Asia. Set loose to look pretty on ponds and other waterways, they have adapted well enough to Wisconsin to be classified as a nuisance invasive species. Along with the arched neck, mute swans have an orange bill with prominent knob that distinguish them from the two native swans. Despite the placid appearance, they can be aggressive birds that attack and drown other waterfowl. It would be marvelous if swans nested at Six Mile Lake, though it’s unclear whether the lake offers the right conditions. They build nests on sites surrounded by water, according to Cornell, such as an island, floating vegetation and beaver and muskrat lodges or dams. The adults seen a week ago likely will return to a nesting site they’ve used before. The juvenile won’t reach breeding age until about 4 to 6 years old, though some have formed pair bonds as young as the second year and tried to nest at age 3. Swans usually mate for life, unless one dies or the pair becomes unproductive, according to the Trumpeter Swan Society. The first three years of a swan’s life are the most precarious, but if they reach maturity, only a handful of predators are big enough to try tackling an adult swan. The main threats are lead poisoning from ingesting shot or lead sinkers, powerline collisions and the loss of wetlands and other habitat. But if they avoid these hazards, trumpeter swans are capable of living two to three decades in the wild, the society states on its website. So take time to appreciate these survivors if they happen to touch down on a waterway in your area. But don’t get too close — swans can be sensitive to human disturbance and may abandon nests or burn up needed energy in winter if they feel threatened. Area wildlife rehabilitator Phyllis Carlson will offer her owl program to the public in the next several months, starting at 6:30 p.m. Monday, April 15, in the lower level of Norway City Hall. This is a similar program to what Carlson, of Quinnesec, has presented with her great horned owl, Journey, at schools in the region. The program is sponsored by the Dickinson County Library. 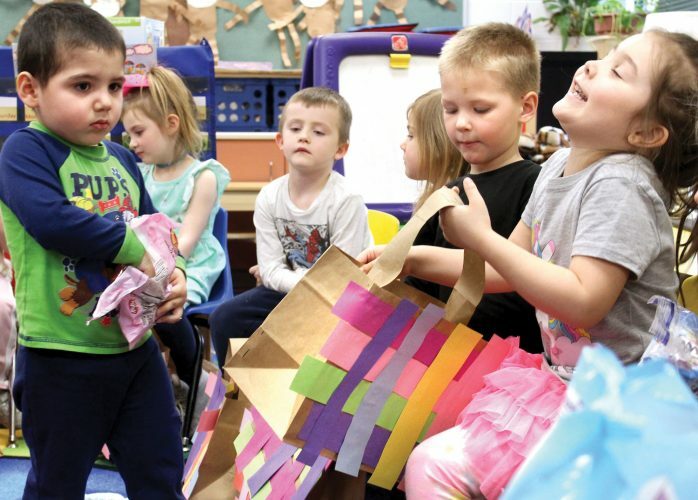 She and Journey also will appear at 10 a.m. and 6 p.m. May 9 at Bay College West in Iron Mountain and at 1 p.m. June 18 in the Florence County Library in Florence, Wis. The latter program will be in conjunction with Marquette’s Chocolay Raptor Center and will include live hawks and falcons from that facility. These program are free and open to the public. Carlson also advised residents to clean up those oriole and hummingbird feeders, as they ideally should be ready to go by the last week of April. Early reports already have hummingbirds in far southern Illinois and Indiana, Carlson said. The average return here tends to be very late April and early May, she said. In her experience, having the feeders up before the birds arrive can result in more of them sticking around, Carlson said. The weekly Wisconsin Birding Report by Department of Natural Resources conservation biologist Ryan Brady indicates common loons have been seen as far north as Lake Wausau, but most of northern Wisconsin — and, in turn, the U.P. — still has only the very early migrants such as common grackles and red-winged blackbirds. But the warming weather and dampness did prompt Brady to recommend treating bird feeders weekly with a 10 percent bleach solution to avoid salmonellosis outbreaks, especially among the small finches.